A major part in getting your lawn looking its best for the spring lawn care season is seeding. Believe it or not, there are actually proper times when you should begin the seeding process. You also have to keep in mind if you are using the proper tools, and if the seed quality meets State standards. All of this can sound very intimidating, but once you learn the tips and tricks, you’ll find that it isn’t so bad. Learn all the best practices you need to know when seeding your lawn below! Timing is key when it comes to seeding and reseeding your lawn. The best time for planting grass is at the beginning of its growing cycle. Do you when the growing cycle starts? Did you know that there are multiple growing cycles depending on what season it is? It all sounds very complex, but it’s simpler than you think. 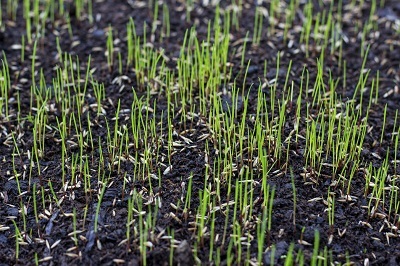 You can learn about when is the best time to seed your lawn here. Although timing is important, it’s not the only thing that will magically make your lawn grow. Various other things are vital in making sure your lawn is seeded properly. Everything from the tools used to seed to the actual seeds themselves can affect how your lawn will turn out. Did you know that one of the main reasons that grass seeds fail to grow is because they are planted too deep? Proper seed placement makes a big difference. Seed quality also matters. All lawn seed must meet certain State requirements and should be tested for purity and germination. You can read more about those requirements as well some other key factors that can help you successfully seed your lawn here. Once you know the proper time to seed and you have all the necessary equipment, the next step is to actually begin seeding. It can be a lengthy process, but if you know what you are doing and are prepared, then you shouldn’t have any issues. You may even decide that you don't’ want to tackle this project on your own. Whether you do it yourself or bring in a professional, you can see the step-by-step overview here. It will help you know what you’re in for if you choose the DIY route! If you do end up choosing the DIY route, make sure to check out our DIY spring lawn care checklist. Want more insights on how to keep your lawn healthy for the entire spring lawn care season? Download our free lawn care guide! Click the button below to get your free copy!